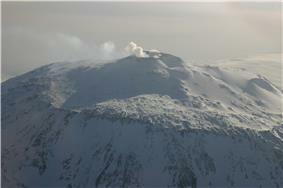 Aerial photo of Mount Erebus on Ross Island. The scientific bases of Scott Base (New Zealand) and McMurdo Station (USA) are the only permanently occupied human habitations in the area, though Amundsen–Scott South Pole Station is partially within the territory and dependent on logistics operations based in New Zealand. The Dependency has a snow runway at Williams Field, and depending on conditions and time of year, two Ice Runways. This guarantees accessibility by wheeled and ski equipped aircraft year round. ^ See Richardson, Ivor L. M. (1957). "New Zealand's Claims in the Antarctic".